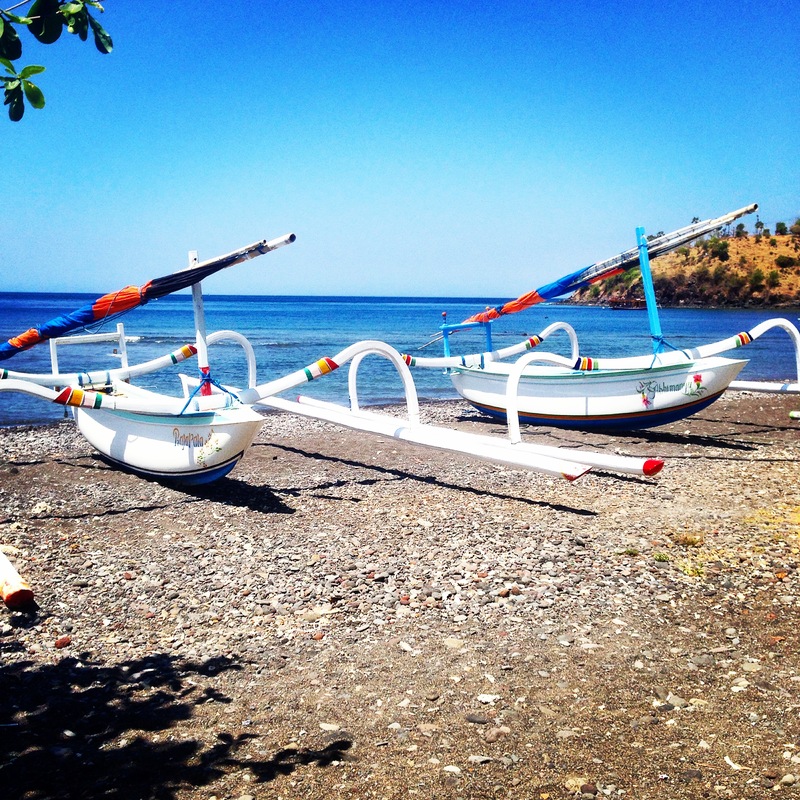 Amed & Jemeluk: Up up and away toward the Northeast side of Bali to find the perfect beach spot and place to step on a boat to Gili or Lombok. Amed wasn’t very touristic but the tourists that were there all were here to make use of their small harbor called Jemeluk to get to the magical Gili Islands. The area was a real fishermen’s place with small boats gathering fish during the day. We were happy to see some beach the previous places (Ubud and Sidemen) were all inland and jungly. I would definitely recommend the route that we took through Bali, also because Amed had a lot of (cheap) boats going to the Gili’s. We bought a ticket to Gili Meno for 275,000 which was a 45 minute boatride. Only to find out the next day that the boat didn’t stop in Gili Meno (because the large boats would break the coral), so we ended up changing the game plan and going to Gili Air instead. BARracuda’s Drinks: We walked the whole day because we had rented really cheap snorkeling gear (20,000 Rupiah) on the left side of Amed only to discover why it was so cheap: you couldn’t snorkel there only on the complete opposite side on the right. But it was a good work out. Afterwards we walked again another 1,5 hours to return the snorkeling gear and were thirsty for a good old cold Bintang (which is by the way owned by Heineken and Bintang means star in Indonesian, which is funny because on both Heineken and Bintang there’s a star as logo). Anyhow we ended up on this awesomeness beach bed. 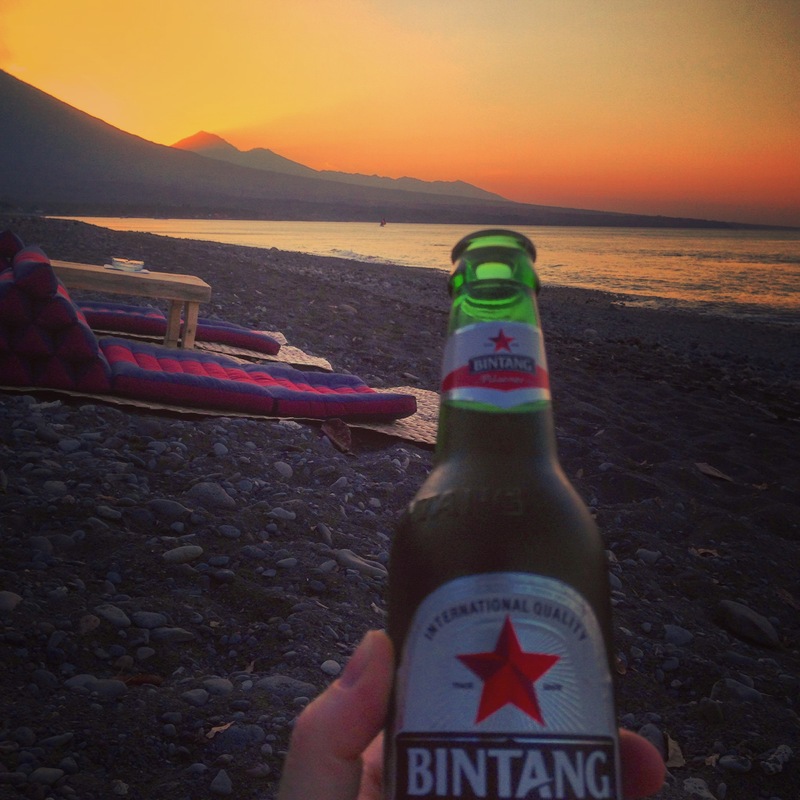 While we sat on the beach we saw the sunset disappear behind the Ganung Agung. When it got darker they lit up the place with small candles and a local started jamming reggae on his guitar. Sama Sama Bungalows: Although the rooms weren’t that special the breakfast view was great in Jemeluk! Across the street you walked into the breakfast area that was literally located on the beach. 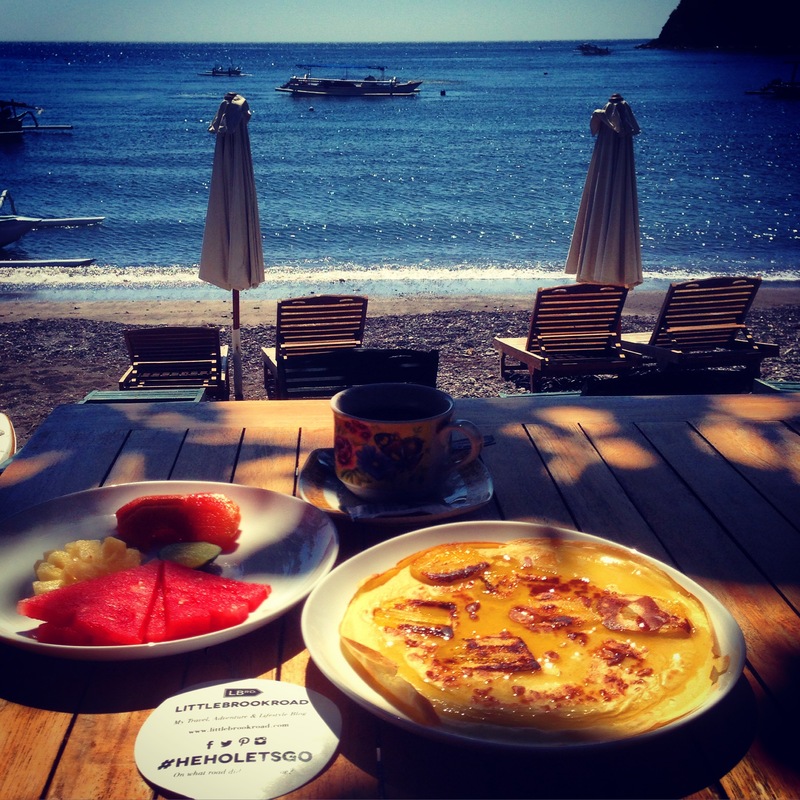 The breakfast itself was a healthy light meal but the view made it complete. They were really friendly, we paid 401,000 Rupiah per night and the staff tipped us to walk up the hill on the right side to see the sunset behind the Mount Ganung Agung: Wow how romantic! Fishermen and kids on the beach: At the end of the day take a stroll along the beach. You’ll spot dozens of kids running with clothes and everything into the water to cool down. They tried the classic ‘skip a rock as many times as you can over the water’ and was nice to see. Further on the beach something caught our attention: a huge group on men holding on either side a net that was connected to a boat in the water while a man with snorkeling gear swam in the middle. They were off hunting fish and not a few moments later all the kids ran to the men and while they tugged the nets inwards the kids started frantically helping and shouting. The fishermen had caught small sardines and the kids were allowed to take them. They do this everyday and then the kids were completely thrilled to put a few of the fish in their plastic bag. I guess for mom to fry up later in the pan, but for now they had a new pet. That’s all folks, next stop: Gili Air. For tips on other places: check out my older posts on previous villages and cities that I visited. Keep you updated and posted. Until then Matur Suksma or Terima Kasih! Want to ask me something? Feel free to leave a comment below! Like me on Facebook & follow me on Instagram to get even more tips and on the spot highlights. Hahha het was echt een giller! Wij 3 uur op en Neee gelopen voor 35 cent te besparen! Awkward! Dikke kus van ons! Zo kun je nog veel langer weg blijven! Je kent de kreet: zo komt Jan Splinter door de winter. Wat zien jullie geweldig veel. Prachtig allemaal. Snorkling was nice😀😃😀and THE sunset romantic How cool !! !